I bought the "yellow" set a couple of years ago; they have held up marvelously! Yellow is actually sort of a gold. Note that the design of the back slats is "bamboo". I am not very fond of the design, but these things come in SO handy. They are quite sturdy. For extra seating during Winter holidays, have had quite heavy individuals sitting on them and never a creak, and both are still in great shape. There is no mark on them whatsoever, they still look new. 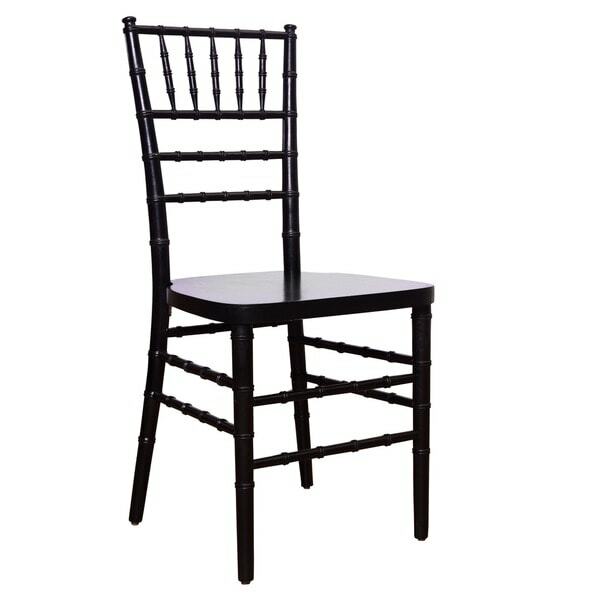 These stackable ballroom chairs are the perfect solution when you need extra seating for family gatherings and neighborhood poker tournaments. Their lightweight beech wood construction makes them easy to stack, store and move where you need them. They feature a vintage style that blends seamlessly with virtually any decor from shabby chic to traditional American. These chairs did not disappoint me one bit! I was looking for an affordable version of Jonathan Adler's Chinese Chippendale chairs and these fit the bill perfectly! They came packed very tightly (2 chairs to a box) and were delivered 1 day earlier than originally expected. They are a beautiful black stain. Some areas are slightly distressed, looking more of a deep, deep brown than black. However, this is hardly noticeable and I personally think it makes the chairs look more authentic. One oversight I noticed was Overstock does not provide the seat height in the dimensions information. Despite my attempt to use the online chat to ascertain this information, I had to order the chairs and pray they would fit under my table. Thankfully, they did! For those of you experiencing the same problem, the seat height is 17.5 inches. Overall, I am thrilled with these chairs. They are going in the dining room of my first apartment. For the price, they are of great quality and provide great style! I bought these chairs because the price was so great and I wanted the Hollywood Regency - Bamboo Chippendale style chair (picture the Jonathan Adler Chippendale chair). All the ones I found, like the aforementioned Jonathan Adler chair, were outrageously expensive, and I needed 10 chairs! Finding these chairs (in pairs, no less!) was a dream come true. They are a little lightweight looking, and they are ballroom chairs, but they look great in my dining room and I have received so many compliments! The purchasing process was simple and the chairs came quite quickly, packaged well in the boxes they were in. Overall, I am extremely happy with my purchase! The 2 sets of black stackable chairs I ordered arrived fully assembled, which was great! The chairs look nice in my kitchen and are comfortable with or without the small seat cushion I added. The chairs come in other colors, too, which is nice, and can blend well in any room. Wonderful chairs for small space. I absolutely love these chairs. I was looking for 2 chairs to put with a small drop leaf table in my family room and these fit the bill exactly. They are so chic and well made and with the addition of cushions will do just fine for sitting at the table. Don't hesitate to purchase if you are in the market for smaller profile chairs. This was my first purchase from Overstock and the chairs arrived the next day and were packaged so well. Very pleased with my purchase. I've been looking for these chairs for awhile and was delighted to see them on Overstock for less money than elsewhere. I immediately ordered 2 sets(4 chairs) in black. They're perfect for additional seating at a dining room table because they don't take up much space.They arrived on time, very well packed and in perfect condition. I'm using cushions on them since it's a wood seat but with the cushions they're quite comfortable. I would order them again. Very useful small, black chair. Small side chair-it was perfect for what I needed. What great looking, quality chairs! I feel like I practically stole these. If I had a place to store them, I'd but a replacement set for when these wear out, that's how much I love these chairs. What a deal! Chairs arrived quickly, no assembly needed. Good quality, exactly what I was looking for. good side chair, perfect to use when you have extra company. these chairs are classic. very light and easy to move around. probably will order 2 more. We love these chairs, because they arrive fully put together in one piece, and are perfect and very sturdy. They are comfortable, (though wouldnt be for a long time.) The seat is flat, not contoured, which would be more comfortable. A thin cushion could be used... they are just so cute and unique and sturdy., and great for little apartment dining area; they look perfect with the black table we purchased on Overstock. I was very impressed by the quick delivery of these already assembled chairs, which are sleek, elegant and light. These chairs are exactly what I alway rent from our local tent company when I have more guests than chairs to add to my table. They are perfect and elegant and mix in well. I am happy I chose to purchase them so I don’t have to rent them anymore! These are nicely made and sturdy. The only drawback is that the seats are not very wide or deep so it's hard to get really comfortable, but for a party and/or extra seating for guests they are good. These are so elegant and they are unobtrusive. You can add guests to your table and not have to worry about having to break out a bunch of mismatched ugly chairs. They are stackable so very space saving. The chairs arrived in a good, strong box, and the backs of the chairs were wrapped, but the exposed seats on both chairs were marked with multiple indents. It appears the damage existed before packaging and delivery. Otherwise, the chairs were sturdy and comfortable. Good value for the cost; fits my needs of additional dining seating when needed. I wanted small but sturdy chairs to set in the corners of my guest bedrooms. These worked out perfectly. I can also pull them to the kitchen table when I need more seating for company. Good for extra chairs.to have. Just purchased the chairs in black. They arrived before time. However issues with UPS delivery. No fault of Overstock.com. The chairs are well worth the wait. They are gorgeous addition to my table. They are petite, but extremely comfortable. My table seats 6, and I purchased 4 chairs. Great for small spaces. Got these chairs to match a shaker kitchen table and they are just absolutely charming together. Same black wood and great quality, as I have learned to expect from my Overstock purchases. Would but these chairs again, and have spare on hand for guests! "How much weight will they hold?" Unfortunately, information regarding the weight capacity is currently unavailable. We apologize for any inconvenience. Hello Melissa G. Seat height is approximately: 17.375''. Please let us know if you have any further questions. Love the 'almost' Shaker style and the sleek lines and definitely the price for 2 is fantastic! I really needed chairs that were stackable for a small space! For the size and style, also the reviews are favorable so I am hopeful that these will work for me.